International bestselling Author Katie Jennings is the author of eight full length novels, including the popular fantasy series The Dryad Quartet as well as the bestselling family drama series The Vasser Legacy. She lives in sunny Southern California with her husband and cat, who both think she's the biggest nerd ever. She's a firm believer in happy endings and loves nothing more than a great romance novel. So Fell the Sparrow by Katie Jennings tells the story of Dr. Grace Sullivan and how she deals with the death of her parents, a mysterious inheritance, and the presence of spirits from another world. Grace is not the kind of person that believes in the existence of ghosts and paranormal phenomena, so when she is faced with inexplicable events, even though she decides to use the services of a team of ghost hunters, she is still skeptical about the existence of the spirits. The story progresses, and as Grace is struggling with the loss of her parents, the other-world presences, the medium and ghost hunters team, she is overwhelmed by her feelings and the never-ending mystery of the inherited house. 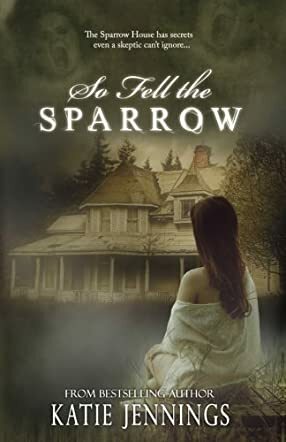 So Fell the Sparrow is more than a ghost story; it draws you in from the start with an engaging title, a wonderful cover, and excellent writing style. I would recommend Katie Jennings’ novel for everyone that wants to read a ghost story that will keep you interested from beginning to end. The characters and story are strongly defined by the author, which makes it easier for readers to envision the world that Katie Jennings describes. If you like ghost stories and are not afraid of a little mystery, So Fell the Sparrow is the book for you. The action happens in exactly the kind of small town that you would think a ghost tale would happen, and it has everything you need in order to enjoy it from cover to cover. Expect sudden turns of events, powerful characters, a unique love story, and a frightening storyline.